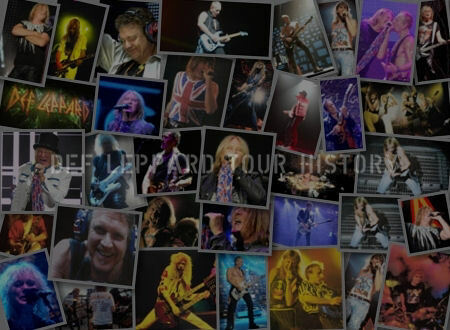 A listing of all the known songs played by Def Leppard during the 1992/1993 Adrenalize world tour. The acoustic instrumental 'S.M.C.' (Stephen Maynard Clark) was played in Ireland, UK and Australia/New Zealand as an intro to BOTH. A Rolling Stones song was sometimes played in place of BOTH during the acoustic section. 'From The Inside' and 'Two Steps Behind' were technically still B-Sides when they were debuted during the tour in 1992 and 1993. They were later included on the 'Retro-Active' album which was released just a few days after the tour ended. 01 Now I'm Here By Queen in London. 02 Can't Get Enough (Of Your Love) By Bad Company multiple times. 03 Elected By Alice Cooper in Largo/Landover. Full electric cover versions played during headline performances on the main tour and at the Freddie Mercury Tribute show. 'Elected' was performed on US Election night in November 1992 after Joe had read out the result on stage. 01 Wasted During acoustic medley in Toulouse. A brief acoustic snippet of 'Wasted' was played during the medley section at a show in France. 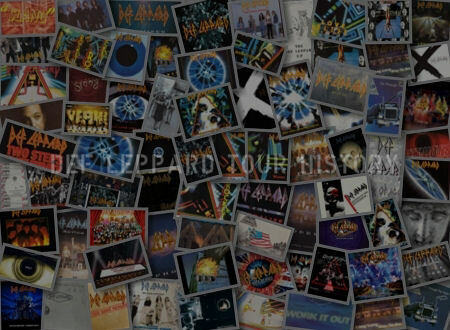 01 Whole Lotta Love (Rocket) By Led Zeppelin multiple times. 02 Black Betty (Armageddon It) By Ram Jam multiple times. Various tags/snippets by Joe during electric songs. Usually tagged onto the beginning, middle or end of a song. 'Whole Lotta Love' by Led Zeppelin was tagged during the mid section of 'Rocket'. 'Armageddon It' was usually preceded by a snippet of Ram Jam's 'Black Betty' as an intro to the main song. 01 Ziggy Stardust (acoustic) By David Bowie in Stockholm. 02 My Hometown (acoustic) By Bruce Springsteen in Sheffield. 03 Walk This Way (acoustic medley) By Aerosmith multiple times. 04 Over The Hills And Far Away (acoustic medley) By Led Zeppelin multiple times. 05 Wanted Dead Or Alive (acoustic medley) By Bon Jovi in East Rutherford. 06 Back In Black (acoustic medley) By AC/DC multiple times. 07 Enter Sandman (acoustic medley) By Metallica multiple times. 08 Smells Like Teen Spirit (acoustic medley) By Nirvana multiple times. Various acoustic snippets played during the new acoustic medley section on this tour. The first all acoustic performances the band had ever done in concert. Played by Joe, Phil, Vivian and Sav. Joe played the first ever pre-'Two Steps Behind' snippet at the Don Valley Stadium show in June 1993. A Bruce Springsteen song before the main concert debut of 'TSB'. A short snippet of 'Ziggy Stardust' was played as a tribute to Mick Ronson in Sweden in April 1993 following his death the day before. Snippets/Tags - Lines from another song added by Joe during/at the end of a Def Leppard song. 01 Now I'm Here w/ Brian May in London. 02 Can't Get Enough (Of Your Love) w/ Jon Bon Jovi/R. Sambora in East Rutherford, NJ. 03 Can't Get Enough (Of Your Love) w/ Lou Gramm in Rochester, NY. 04 Can't Get Enough (Of Your Love) w/ Bryan Adams in Paris. 05 Rock And Roll/Black Dog/Whole Lotta Love w/ Robert Plant in Copenhagen. 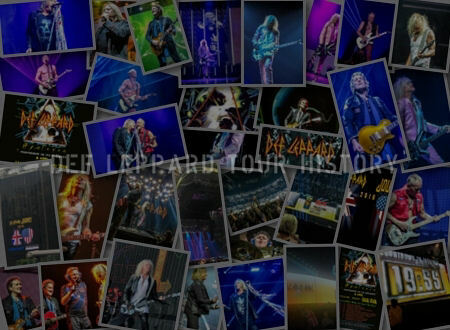 Guest artists appearing on stage with Def Leppard during their headline performances. 'Now I'm Here' was played for the second time with Queen's Brian May at the April 1992 Freddie Mercury Tribute show at Wembley Stadium. The Bad Company song 'Can't Get Enough (Of Your Love)' was performed three times. Twice in the USA with Jon Bon Jovi/Richie Sambora in their native New Jersey and with Lou Gramm in his home city of Rochester. A Led Zeppelin medley featuring three songs was performed with their legendary singer Robert Plant in Denmark during the 1993 European tour. 'Photograph' was cut from the show and crossed off of the setlist to make way for this. 01 I Wanna Touch U Twice in Ottawa, ON. 02 Heaven Is (w/ live vocal) On UK TV in January 1993. 03 Tonight On European TV in January 1993. 'I Wanna Touch U' (as it turns out) was not played live. 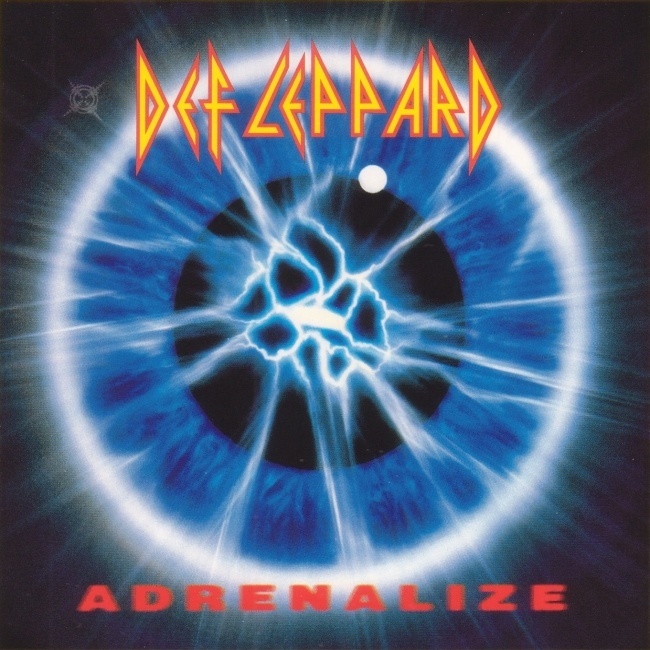 The band 'performed to' the playback audio of the studio version for the recording of the promo video during the last In The Round show in Ottawa, ON in April 1993. It was confirmed by a attending fan that the song was played twice over the PA as the band performed for the video shoot. 'Heaven Is' was played as a mostly playback performance on UK TV show 'Top Of The Pops' in January 1993. Notable for Joe singing the lead vocal live over the backing track. The only known (almost) live performance of the song. The electric studio version of 'Tonight' was performed on at least two European TV shows in January 1993 during the brief UK/European promo tour. The closest the band ever got to performing the electric version live. 01 Dirty Harry Speech By Clint Eastwood at all shows. "I know what you're thinking. "Did he fire six shots or only five?" Well to tell you the truth in all this excitement I've kinda lost track myself. But being this is a .44 Magnum, the most powerful handgun in the world and would blow your head clean off, you've got to ask yourself one question: "Do I feel lucky?" Well, do ya, punk?". Following the quote Phil and Vivian would start off 'Stagefright' as Joe sang "I said welcome to our show!" leading to the curtain fall as the song kicked in. Just before the 'Victim of my vices' line. This intro was used as it had been on the 1987/1988 'Hysteria' tour from 19th June 1992 in Dublin until 6th September 1992 in Rapid City, SD. From the 11th September 1992 show in Salt Lake City, UT until the end of the June 1993 Japanese tour, the intro was modified with the end of the Dirty Harry quote "you've got to ask yourself one question" leading to Joe saying 'Do ya wanna get rocked?' and the band starting the show with 'Let's Get Rocked'. After this the Live Pyromania Album Intro was played before starting the show with 'Rock! Rock!'. 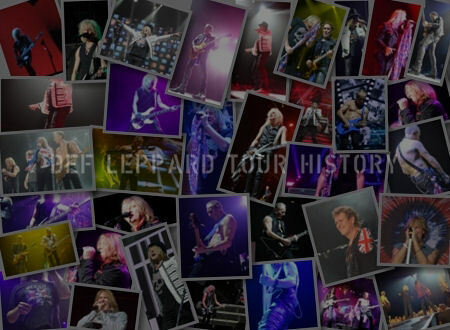 View all tour dates in the 1992/1993 tour section.